With its rounded foliage Crassula ovata are a succulent plant originally from South Africa. 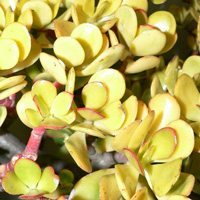 A number of varieties are available sale and this species is another one of a number of plants referred to as the Jade Plant or Money Tree. This interesting group of succulents do vary greatly in growth habit as well as foliage colour. Some are very low growing others can reach over 1 metre in height. Folaige varies from rounded or ‘spoon shaped’ to the triangular foliage of C.perforata and others. Generally gardeners tend to prune them to size, often they are container grown. Older plants can benefit from being pruned back, with the cuttings used to propagate new plants. Although the species are widely grown a number of cultivars are among the most popular varieties, the cultivar C. ovata ‘Hummels Sunset’ is pictured right. C. ovata ‘Hummel’s Sunset’ with its foliage turning yellow to red in winter, a popular cultivar. C. ovata ‘Gollum’ has tubular green foliage and is used as a bonsai plant. C. ovata cultivar ‘Hobbit’ is referred to as the Hobbit Jade. These are a very hardy plant, they grow well in the ground as long as the soil is well drained and also have a growth habit that requires little care or pruning. The occasional tidy up to keep a more compact shape is all that is needed. As with other crassulas, they will grow well in a pot or container in a sunny position, well drained soil (let the soil dry out between watering). Slow growing and often used in bonsai.